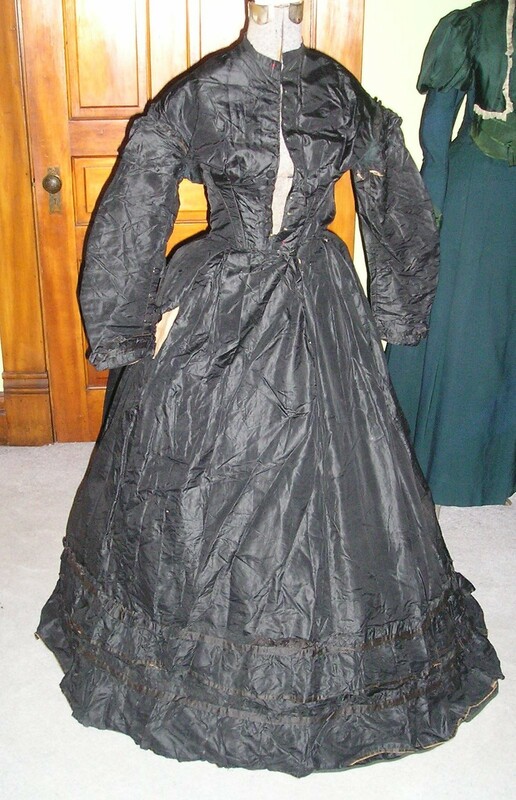 Original 1860s gown in black silk taffeta, possibly for mourning. Boned bodice with drop shoulders, narrow coat sleeves with puff at tops. Fastens in front with 11 crocheted balls buttons, 6 of which are missing. Full hoop skirt trimmed at hem with two self ruffles. 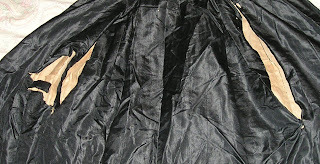 Silk is in good condition for its age, no brittleness or shatter. There are areas of wear though on the bottom side of both sleeves, a tear near the pocket on the skirt and a small tear at the under arm of the left sleeve, and wear around the neck. See photos (note: what looks like another tear in the pic showing the pocket is actually the placket opening for the skirt). Completely lined in brown cotton. Measurements are: B-30" W-24" Shoulders-16" Length approx. 55" though I would recommend this dress for display rather than wear. Sold as is, thanks for looking. Too bad that the condition isn't the greatest but this is from the early 1860's. 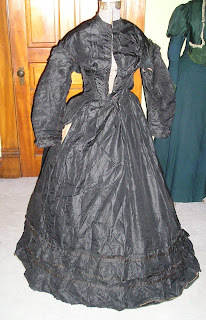 I think mid-1860s; that skirt is flat in front and bulging weirdly over the round hoop. The two short hem ruffles become more common in later years, too. Earlier dresses tend to have one deeper flounce. I think the flat front is more due to the hoop it's been put over than the dress itself. The shoulders slope and the sleeve shape (notice how it's really big right before the cuff) and that odd little ruffle all look earlier to me. I guess it could have been used through out the Civil War and changed slight towards the end but the bodice looks older. That's just the camera flash. ;-) It happens all the time to me with things that are only slightly sheen and makes them look like super shiny poly. I bet the silk is more like this one. Basically: "If a lady can have but one silk dress in a series of years, she will find a black silk will be of more use to her than any other color. 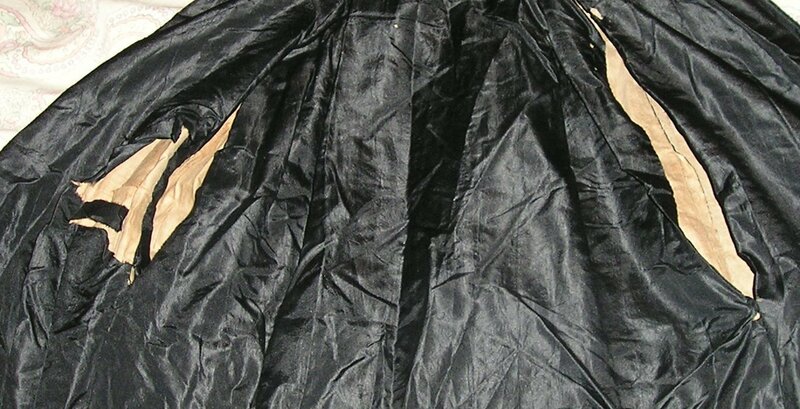 Black is becoming to every complexion, and a black silk may be worn at a wedding, a party, a funeral, or to church. It is nowhere out of taste except in the kitchen."